While Alma and Amulek were imprisoned in Ammonihah, “the earth shook mightily,” causing “the walls of the prison [to be] rent in twain, so that they fell to the earth” (Alma 14:27). Miraculously, Alma and Amulek walked away unharmed, but their detractors “were slain by the fall” of the walls. Meanwhile, Mormon reported that the people of Ammonihah “heard a great noise” and therefore “came running together by multitudes to know the cause of it” (v. 29). The “great noise” mentioned in Alma 14:29 may have been the rumblings of the earthquake, or perhaps the sound of the walls collapsing.4 If earthquakes were a common occurrence in Book of Mormon lands,5 however, these would hardly merit the response of the people, “running together by multitudes to know the cause of” the sound. Grover, therefore, suggested it was a peculiar feature unique to a specific kind of earthquake. One important fruit that emerges from geological analysis of this narrative is that the events described are geologically possible. Nothing in the story is implausible based on historical and geological information about earthquakes. This includes the miraculous emergence of Alma and Amulek from the ruins of the prison. As discussed above, it even potentially identifies the type of earthquake involved with a high degree of specificity. Learning and understanding the science behind miracles need not make them any less miraculous. Latter-day Saints and other modern Christians often see miracles in otherwise ordinary events which occur at just the right time. The miracle is often in the timing, the extremity or severity of the event, or the way the outcome accomplishes the Lord’s purposes. When individuals feel the touch of God in their lives, that is when a miracle has occurred. Even if Alma and Amulek’s earthquake was a naturally-occurring phenomenon, important details remain remarkable and miraculous. All of Alma and Amulek’s captors are killed in the prison’s collapse, while Alma and Amulek themselves miraculously emerge unscathed. Furthermore, the supershear earthquake’s sonic boom created a particular noise that drew the people “together by multitudes” to behold the awe-inspiring power of God in preserving Alma and Amulek. Not only did this earthquake create a means for Alma and Amulek’s escape, but it created an opportunity for them to demonstrate their role as true messengers from God. 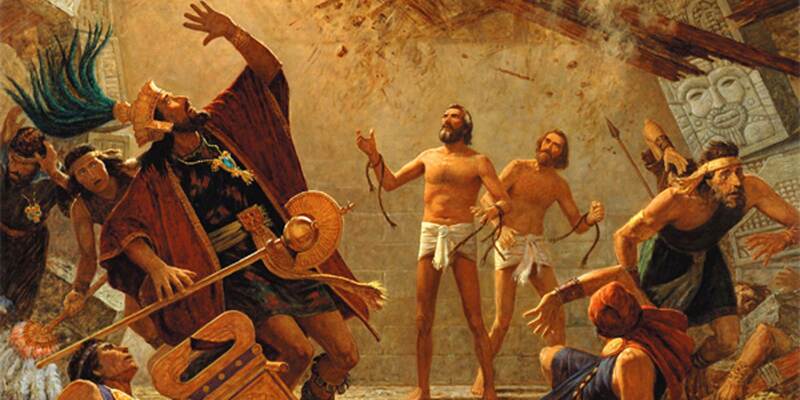 Neal Rappleye, “‘The Great and Terrible Judgments of the Lord’: Destruction and Disaster in 3 Nephi and the Geology of Mesoamerica,” Interpreter: A Journal of Mormon Scripture 15 (2015): 143–157. Alonzo L. Gaskill, Miracles of the Book of Mormon (Springville, UT: Cedar Fort, 2015), 179–188. Jerry D. Grover Jr., Geology of the Book of Mormon (Vinyard, UT: self-published, 2014), 198–201; 214–216. Brant A. Gardner, Second Witness: Analytical & Contextual Commentary on the Book of Mormon, 6 vols. (Salt Lake City, UT: Greg Kofford Books, 2007), 4:241–242. 1. Brant A. Gardner, Second Witness: Analytical & Contextual Commentary on the Book of Mormon, 6 vols. (Salt Lake City, UT: Greg Kofford Books, 2007), 4:241, 242. 2. For a review of the different kinds of faults and the earthquakes they cause, see Jerry D. Grover Jr., Geology of the Book of Mormon (Vinyard, UT: self-published, 2014), 57–62; on the Mercalli Scale, see p. 63. 3. Grover, Geology of the Book of Mormon, 201. 6. Grover, Geology of the Book of Mormon, 200. 7. Grover, Geology of the Book of Mormon, 198–201 compares these requirements to Sorenson’s Mesoamerican model, and finds that Ammonihah is located in an ideal location. Other Mesoamerican models (pp. 214–216) fail this requirement. For a convenient summary of Grover’s criteria and how a handful of Mesoamerican models fair, see Neal Rappleye, “‘The Great and Terrible Judgments of the Lord’: Destruction and Disaster in 3 Nephi and the Geology of Mesoamerica,” Interpreter: A Journal of Mormon Scripture 15 (2015): 143–157. Work remains to be done to determine if any non-Mesoamerican models can satisfy this and other criteria, which Grover outlined throughout his book. 8. See James K. Hoffmeier, Israel in Egypt: The Evidence for the Authenticity of the Exodus Tradition (New York, NY: Oxford University Press, 1997), 146–149; K. A. Kitchen, On the Reliability of the Old Testament (Grand Rapids, MI: Wm. B. Eerdmans, 2003), 249–254.